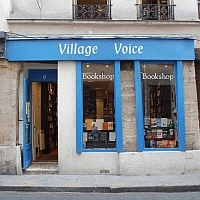 Not shocking yet still sad, the famed and fabledVillage Voicebookstore on Rue Princess inParis Sixth arrondissment will close its doors for good on July 31. During my early days in Paris, I sat close to Amy Tan as she read, and this is where I met David Sedaris, and made contact with Diane Johnson. Owner Odile Hellier is an incredible woman, and we love her helpful staff. Bookstores and print journalism are threatened by this new world of electronics. To borrow the American Library in Paris lament,” in a letter to friends and patrons, founder and owner Odile Hellier cites the reasons which will surprise no one who follows trends in publishing and bookselling. On-line book retailers such as Amazon and the growing popularity of e-readers, among other market forces, are threatening independent bookstores all over the world. So I continue my own lament and comments, the petite Red Wheelbarrow stands on a narrow street in the Marais. This independent shop will also be missed. Shakespeare and Co;, a left-bank cultural and tourist landmark lives on for now. I remember our beloved Bright Books inSt. Petersburg,Florida. Dear independent bookstores, rest in peace. You are currently browsing the Pam’s Paris weblog archives for June, 2012.